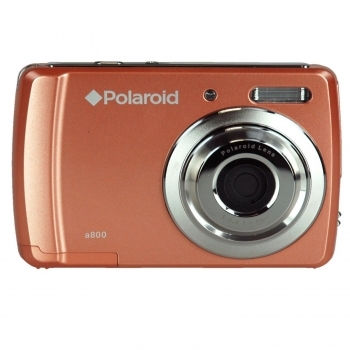 The compact easy-to-use a800 eight megapixels digital camera by Polaroid boasts a 2.4-inch LCD display to help you shoot outstanding photos of your friends and family. Use the 4x digital zoom to get up close and personal to your subjects, and store your best photos on the 16MB built-in storage. It also features SD/SDHC card expandability so you can shoot and store hundreds of photos on one card. Ensure that everyone looks their best with face tracking and smile and blink detection. You'll enjoy other built-in features like HD video with sound, auto flash, red-eye reduction, and a self timer that lets you be in every shot. Accessories include a USB cable for computer connection and photo editing software on CD-ROM.